Gartenwelt 10: 14. 1905 (1906); Gurke in Monatsschr. Kakt. xvi. 120. Origin and Habitat: This subspecies occurs only in the deserts of eastern Queretaro. Mammillaria decipiens var. albescens (Tiegel) Repp. Dolichothele camptotricha f. brevispina hort. Mammillaria camptotricha f. brevispina hort. 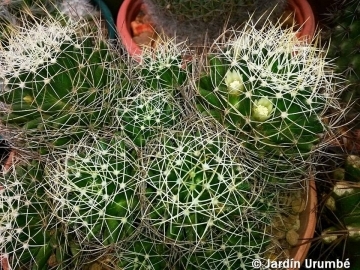 Description: Mammillaria camptotricha (Dolichothele camptotricha) is a small plant that make a large, flattish clump of stems clustering from the lower part. 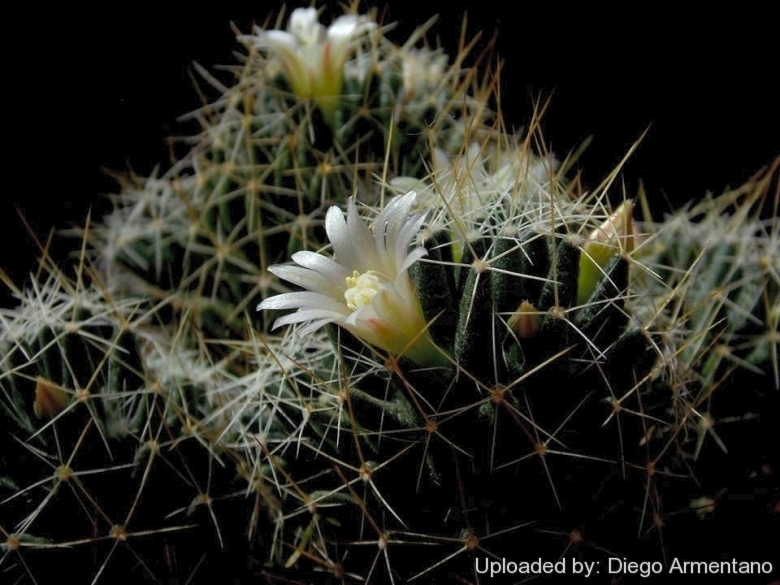 Not only it has long slender tubercles, which are similar to those of other Dolicothele species, it also has very long twisted spines, which on mature plants, completely envelop the body, and have earned this species the name of "Birds Nest Cactus". The new growth is very attractive, the long, entwining yellowish spines soon form a mat through which the small bell-shaped flowers, white, greenish outside that arrive in late summer or early autumn. This flowers are very insignificant, because they are shorter than the tubercles, and consequently little can be seen of them, merely a pure white splash of "colour" between the tubercles. Stem: Individual stems bout 4-7 cm in diameter, up to 10 cm tall, broadly globose to club shaped, depressed, pale matt green to deep-green, this colour is very variable because if the plant is grown in strong sunlight, like many other succulents, it takes on a very reddish colour, in order to prevent damage to the chlorophyll plastids, or if it is grown in partial shade, it becomes a very pallid green, and looks very unhealthy. Tubercles: Green, soft, flabby, cylindrical to obtuse about 2 cm long, terete often curved, not at all milky. Areoles: Small, circular, a little woolly at first; axils of tubercles sparsely hairy with a few bristles. Radial spines: Usually 4-5, but varying from 2 to 11, thin, needle-like, flexible, (sometime bristly and twisted), spreading, 7 to 30 mm long, yellow, or white, sometime brown tipped, interlacing densely in full light. Central spines: Usually absent, occasionally 1 or 2, slender needle like straight, golden or brownish about 18-30 mm long almost straight to strongly twisted or bent. Flowers: Funnel-form, delicately scented, mall, white, deeply set in the tubercles, to about 1-1.8 cm long and c. 1 cm wide. The outer perianth-segments of the flowers are greenish. Inner perianth-segments white, 10 mm long, acute. Mammillaria decipiens Scheidw. : ( ssp. decipiens ) Plants with about 5-11 radial spines that tend to be whitish. Distribution: San Luis Potosi, Guanajuato, and Queretaro. Mammillaria decipiens subs. albescens (Tiegel) D.R.Hunt: This subspecies has 3-5 radial spines that are generally shorter, straight, and white. Distribution: Guanajuato and Queretaro. Mammillaria decipiens subs. camptotricha (Dams) D.R.Hunt: Usually it has 4-5 radial spines that are bristly and to 30 mm long. Distribution: Queretaro. Mammillaria decipiens subs. camptotricha cv. Bru: (a.k.a forma brevispina) with pale green body with 4 to 5 very short golden radial spines . Mammillaria decipiens subs. camptotricha cv. Marnier-Lapostollei: (a.k.a. 'Madam Marnier') It is a a distinctive clone with pale green body that bears very short reddish tipped tubercles (10-12 mm long ) and tightly strongly curved or twisting gold spines only 6-9 mm long. The flower is small and white. Cultivation and Propagation: Mammillaria decipiens subs. camptotricha is a freely clustering species that reproduces easily by cutting. It is a great starter plant for the cactus grower, that readily builds up into a dense cluster of stems. Does better than most species in lower levels of light, but still prefers bright light or morning sun. Growth rate: Plants will offset readily, and dense clumps can be produced in a very few years. Soils: It likes very porous mineral substratum and avoid the use of peat or other humus sources in the potting mixture. Repotting: Repotting every 2-3 years, or sooner if the roots get crowded. . As it is prone to rot under-pot in a smaller container filled with very porous compost. Use pot with good drainage. Hardiness: It is quite frost resistant if kept dry, hardy as low as -5° C (some reports give it hardy to -7°C). However some warmth throughout the year will increase the grower's success (minimum 5° to 8°C during rest season). A resting period in winter and strong light are necessary so that it can flower properly. Exposition: Outside filtered sunlight or afternoon shade, inside it needs bright light, and some direct sun. Subject to sunburn if exposed to direct sun for too long. Does better than most species in lower levels of light, but still prefers bright light or morning sun. Propagation: Direct sow after last frost or (usually) or division . Seeds germinate in 7-14 days at 21-27° C in spring, remove the glass cover gradually as the plants develops and keep ventilated, no full sun for young plants! The seedlings should not be disturbed until they are well rooted, after which they can be planted separately in small pots. Cuttings: wait until the offsets that appear at the base of old clustered specimens are 1/3 the size of the parent and then detach and plant. Cuttings will take root in a minimum temperature of 20° C (but better in hot weather). Cuttings of healthy shoots can be taken in the spring and summer. Cut the stem with a sharp, sterile knife, leave the cutting in a warm, dry place for a week or weeks (depending on how thick the cutting is) until a callus forms over the wound. Once the callus forms, the cutting may be inserted in a container filled with firmed cactus potting mix topped with a surface layer of coarse grit. They should be placed in the coarse grit only; this prevents the cut end from becoming too wet and allows the roots to penetrate the rich compost underneath. The cuttings should root in 2 to 6 weeks.